K9 Manners & More of Broken Arrow, OK has reported results for the final game of the summer 2015 series of the National Dog Agility League. In the view of the National Dog Agility League K9 Manners & More is an excellent club that approaches the game with a sense of fun and adventure. This club embodies the spirit of play that is the fundamental mission of the NDAL. We’re pleased and proud to have this club playing with us each month! You can view those results OCT RESULTS. We are expecting results from one more franchise club. Though it’s possible we can be surprised by the unexpected new league club. If you have interested in jumping into League Play, the October workbook for the final game of the summer series can be downloaded HERE. We’ll be accepting results for this event through the end of the day, October 31st. We’re planning a two month series beginning in November that will be based on a 50′ x 50′ field size. Kama Rueschenberg (Cave Creek, Arizona) has been invited to design one of the two games. She has not yet confirmed. We’ve known all along that the size of the competition field is an important component of league play. Effective in 2016 we’ll be splitting into two leagues based on field size: 50×50 and 60×70. A club/franchise will be able to compete in both leagues, so long as their competition space fully supports both field sizes. Three more clubs have reported results for the final game of the summer 2015 series of the National Dog Agility League. Sit, Stay, ‘N Play of Stroudsburg, PA.
You can view those results OCT RESULTS. Three more clubs have reported results for the final game of the summer 2015 series of the National Dog Agility League. K9 Powersports in Grand Junction, CO; Dachshund Hill Agility (DHA) of New Glarus, WI; and ClickerPets Mexico in Zapopan, Jalisco, Mexico have reported. You can view those results OCT RESULTS. Lifetime Performance Points have been calculated showing the League standing from the Fall series. You can view those standings here: Fall Series Standings. Several clubs have not yet reported. We can expect some substantial changes in LPP accumulation as LPP are recalculated. 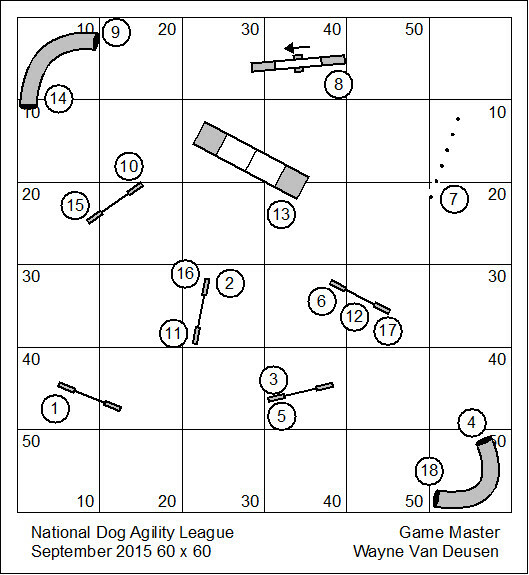 Two clubs have reported results for the final game of the summer 2015 series of the National Dog Agility League. Country Dream Agility (Waterford, OH) and In Contact Dog Training (Springfield, IL) have reported. You can view those results OCT RESULTS. If you have interested in jumping into League Play, the October workbook for the final game of the summer series can be downloaded HERE. In the final hour of the month results were reported by In Contact Dog Training (Springfield, IL); K9 Manners & More (Broken Arrow OK); and ClickerPets Mexico (Zapopan, Jalisco, Mexico). Non reporting clubs have forfeited the September competition. I need to publish a primer on league play. I think many people are expecting it to be an arduous and complicated process to get started. But it’s really as simple as 1) set up the course & run it; 2) send in your results. Consequently the new club is in the league, and is a franchise owner. I’ll get started on that primer right away. If you have interest in jumping into League Play, the October workbook for the final game of the summer series can be downloaded HERE. While it is too late to compete in the first two courses of the summer series, you are invited to run these courses and record your scores with all previous competitors. The August workbook can be downloaded here: August League. 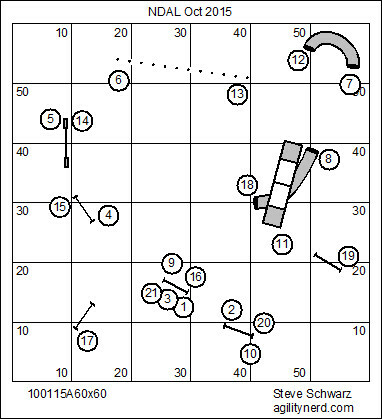 The September workbook can be downloaded here: September League.